It is an absolute fact: no matter how easy the home project and no matter the skill of the projector (projectee? ), projects can quickly spiral out of control. One fix can break something else, a purchase to right a wrong will lead quickly to the next purchase. I have been waiting months to write this post, thinking, that at some point we would be done. Since we will never be done, let's get going. In April, I went to New York City with my cousin. Next to the food at the fair, the best part to me is the competitions (I know you thought I was going to say tattoos but I will get to that later). I think it is cool that at country fairs all over the country, people enter items in contests. And, the contests run the gamut, from food, to crafts, to agriculture. I like the welcome statement on the competitions page, "For 123 years artists, craftspeople, farmers and youth have entered competitions at the OC Fair. In 2012, the spirit of competition is alive and strong in Orange County." I am a bit of a furniture-a-holic, so the very first stop I made was the woodworking competition. Here are my top ten picks, and all of them are distinctly modern, presented here in order of traveling through the exhibit (almost like you are there). #1. This wonderful Nakashima-inspired chair handmade by Tyler Smutz of Killstress Designs (get the play on words kill-stress) is one of my favorite pieces because of the unique two legs. If the maker is this Tyler Smutz he is also a Broadway set carpenter, what are the odds? I have a love-hate relationship with the Orange County Fair. I hate all the bizarre food, the crush of the great tattooed masses and the general dirt and noise. And, honestly, I love it. What could be more mid-century than a county fair? I bring to you a series of posts about the fair. You will feel like you are almost there. The first post is about the food. A true fair person would have eaten the food and told you how fantastic it is, but alas, I can only show you what looks interesting. I am just a tiny bit afraid of fair food. If this gets you REALLY hungry, the fair is running July 13-August 12. You can try it for yourself. On A Thursday night, people filling up the picnic tables for Fair food. What self-respecting mid-century modern fan doesn't love an Eichler? I have often harbored dreams that our house is an Eichler because whoever designed it certainly ripped off all the elements: the central courtyard, plank ceilings, flat roof, and wood floors. Looks kind of like an Eichler? See the window strip on the right? The post and beam construction, the plank ceiling, blah blah, I could show you more. Alas, I have never gone done to the Newport Beach City Building Department to inspect the original plans to see exactly who the mystery plagiarist is. Maybe I will, when the building department moves to their new Taj Mahal location just down the street. Acquiring a Broyhill bedroom set is the ultimate Valhalla for mid-century modern collectors with the Brasila line being particularly distinctive. A search on eBay for Brasilia furniture reveals an endless supply of gorgeous pieces (an original Brasilia brochure compliments of BrasiliaConnection.com). 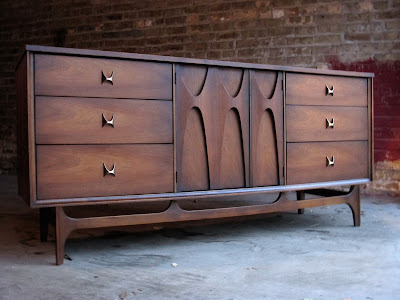 Here is a beautiful Brasilia dresser/credenza on stewzannethingsilike. Yesterday, we found a flyer on our doorstep advertising an Open House for a 1955 mid-century modern in Irvine Terrace at 730 Santana Drive in Corona del Mar, California. Intrigued, we went and talked to the Realtor, Sue Ross-Chayes about the home. It is a three bedroom, two bathroom 1,707 square feet $1,250,000 short sale on a lot that is 7,245 square feet. Here is the listing.Open house is running July 14 and 15th, 2012 from 11am to 4pm. They are looking for offers by Tuesday, July 17, 2012 at 6pm. Before you gasp too loudly at the price, a property on that same street recently sold a few months ago for $1.75M. Of course it was in pristine condition, had a pool and an extra bathroom and was about 2,100 square feet. But, honestly, one story homes are in demand (aging baby boomers) and this one is a deal. It could be purchased quickly, and with a cash infusion, could be potentially flipped for a nice profit. I grew up in what Pam, from Retro Renovation, refers to as mid-century "modest" houses. These are typically ranch or colonial style houses, that are more mid-century and a little less modern. My mom's taste, however, ran to straight mid-century modern, which apparently imprinted me. My mom and I had fun pulling these pictures together. My mom, Donna Minick, adjusting the cool mid-century lampshade. She is a newlywed in this picture, circa 1960, first home in Seattle. I was a Boeing baby (mid-century aerospace reference). Here are some inspired modern lighting ideas from the Dwell on Design Modernism show held June 22-23, 2012 at the Los Angeles Convention Center (now known as the Staples Center and home of the Lakers and Stanley Cup Kings). Let's start out with these cool lights which can be had from Lightopia based out of Laugna Beach. I recently purchased a Jonathan Adler lamp from Lightopia and Lightopia offered the best prices, hands down, of any online shop for the lamp I was looking for. Beautiful lights from Lightopia, locally in Laguna Beach CA.